A 2-night festival of live composition by NYC's experimental forefront of theater, dance, media, and more. Each and every night multiple acts will be featured, followed by an open jam with performers from all over the world. Experience live art created right before your eyes! Live Composition is art-making in real time. Many groups in the Festival use a gestural composing technique called Soundpainting, a sign language for performers. The Soundpainting language was created by Walter Thompson in Woodstock, New York in 1974. The technique was initially only used for music, but thanks to the contributions of Strike Anywhere Performance Ensemble's, Leese Walker, it was developed for actors and, eventually, dancers. Now, joined by more and more new ensembles, Soundpainting is on the verge of hitting NYC as a powerfully vibrant tool for spontaneous performance and storytelling. Visual artists incorporate Live Composition too! Jonathan Checler uses images from the festival to create a projection design; and Samuel Ferri illustrates based on inspiration from the festival itself. For more detailed information on the performances, keep scrolling! Co-Produced by Letter of Marque Theater Co. and Strike Anywhere Performance Ensemble, this Festival marks the first OFFICIAL collaboration between these two groups! Members from both companies have been working together for over a decade and couldn't be more thrilled to be partnering with the Gemini & Scorpio Loft to present this burgeoning celebration of Live Composition. The 3rd year running, this particular year's Festival has a theatrical focus, featuring experimental and cross-disciplinary groups exploring live-composed story, narrative, theme, and journey. Julia Frey and Sam Day Harmet pool their respective experience in music and theater to concoct works that bring new media technology into live performance. Composition: "A People's History of Silicon Valley Pt. 2"
This new theater piece from Casual FreyDay (Julia Frey and Sam Day Harmet) examines the the absurdity, savior complexes, labor abuses, and income disparities of Silicon Valley, scrutinizing and satirizing techno-utopianism using its own digital tools including a live Soundpainted synthesizer soundtrack and a performer-driven multimedia environment. Casual FreyDay is joined by guest synthesizer performers Erica Mancini and Steve LaRosa. For more info on Casual FreyDay, click here. Since 2013, Letter of Marque Theater Co., a proudly Brooklyn-based non-profit ensemble, has been offering plays, tours, festivals, ensemble training, and improv classes. Our mission is to spread ensemble culture through inclusive, responsive, and accessible theater. We envision a future in which success is pursued collectively, and ensemble ideology is a vital part of healthy communities. An original play created, composed, and performed right in front of your eyes about the feasibility of the future and the potentiality of next. This is the story about universal uncertainty of what's happening, and the everyday things we all do that keep us going. Inspired by Bon Iver's "22." Based on audience suggestions. -Using Soundpainting as a theater tool. -Developing gestures for the ‘Who, What, Where, When’ within a scene. -Creating ‘Snap Palettes’ (using audience suggestions). The collective consciousness that is created for each session of Soundpainting is unique to the group of performers generating material in that moment. It will never be exactly the same again, like an imperfect poem or painting that you rip to shreds - you know that it existed and you carry it with you under your skin - but you will never see it again, yet it will always inform the work that follows it, like passing genes from one generation to the next. This accumulation of collaboration allows for some of the most complex beautiful-ugly explorations of the artist's work without having to manage the critical brain whatsoever. Watching a Soundpainting performance is like decoding an artist's personal heiroglyphics - they are inescabably themselves. "I love the camaraderie and spontaneous creativity of live composition. It is inherently collaborative and improvisational, and I love working with people who are interested in making that kind of art. Through this way of working and playing I have found a community of talented artists, a new way of exploring theater and improv, and an appreciation for the brilliant and ever-expanding language of live composition." The Improv Group born out of Letter of Marque Theater Co.’s Brooklyn Improv Training program. Last seen at Let’s Get Weird, a Night of Wildly Experimental Improv, Theater & Music. A long-form improvisation composed of scenes, games, and one-person monologues. Inspired by audience suggestions. -Ensemble improv: the skills of spontaneously creating, as a group, a single piece of work. 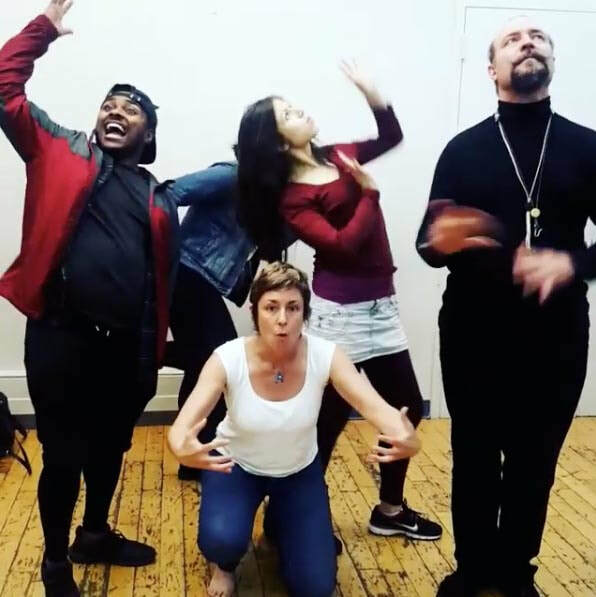 -Rooted in improv techniques by Viola Spolin, Keith Johnstone, and Del Close; along with live composition, our method focuses on collective success, telling the richest story, and tapping into the player’s full instrument. -Areas of focus include: character work, status, medium and long form scenes, embracing the “strong and wrong,” staying present, listening, and finding radical agreement. "Improv has really been perspective changing and shaping for me. It helps me to stay present, attentively listen, lean in to being agreeable and staying positive even when I have the heaviest days at work. I look forward to it every week as it always puts me in such a good mood. Over the past year of doing improv with LOM I feel I have grown so much both personally and in my skill development because of Nolan and Scarlet being not only wonderful teachers but having an open judgement free environment where there are no mistakes only opportunities to sharpen your skills. The experience continues to be priceless." 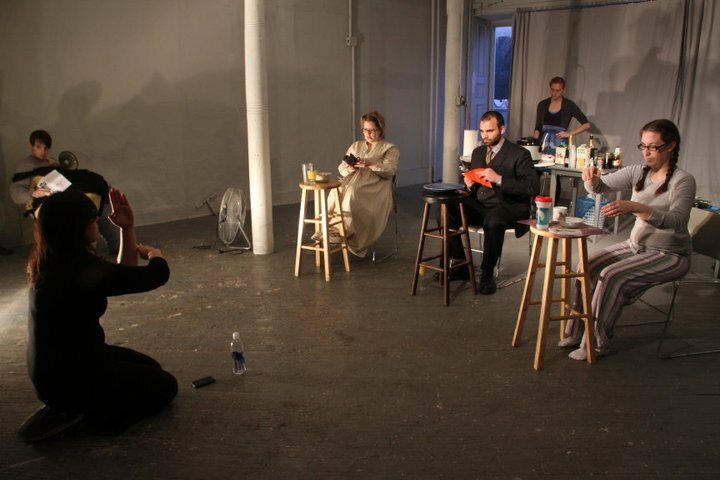 Brooklyn Soundpainting Company is a collective of NYC-based theater artists training to use the language of soundpainting in theater since 2007. The BSC is a multi-disciplinary ensemble working in the art of structured improvisation and spontaneous performance. Precipice is a soundpainted exploration of the NY Times Op-Doc "Ten MeterTower", by Maximilien Van Aertryck and Axel Danielson. "Live Composition (aka Improvisation, Extemporization, Ornamentation, Jam Session) is a fundamental but forgotten companion to the more technical, repertoire-based study of all performing arts disciplines, and it must be carried forward into the 21st century with enthusiasm and bravery. Speaking from personal experience, ensemble improv has freed me to be more spontaneous and imaginative in my own practice, more present with artistic collaborators, and more positive in developing creative ideas with ease and "Yes-and" momentum." ​-Training to use the language of soundpainting in theater. For more info on the BSC, click here. ​Established in 1997, the Strike Anywhere Performance Ensemble is a permanent collective of jazz musicians, modern dancers, and actors. Performers collaborate through an ensemble-based process to create politically-charged, original works. Potato-Heads, Tweets & Royalturds to Live Music - Strike Anywhere soundpaints excerpts from Ubu Roi plunging into the absurdity of the current news cycle. A live-composition crafted in the moment with jazz musicians, actors and dancers. -Performers collaborate through an ensemble-based process to create politically-charged, original works. -Strike Anywhere performances always feature live music, physical theater and modern dance. -The company applies structures and concepts from American jazz to their inter-disciplinary improvisations to create performances that are provocative and alive. For more info on Strike Anywhere, click here. Jonathan Checler is a French-American artist, born in Paris and now living and working in Brooklyn, New York. In Paris, Checler studied stage design and stage direction which heavily influences his visual art practice today. In 2005 Checler moved to New York City. His work explores various mediums such as painting, sculpture, analogue and digital photography, and live performance. "This installation allow anyone to get a part of their body scan on a regular office scanner and have their scan instantly projected on a surface with a projector. The idea came to me a couple years ago, when I wanted to be able to create digital portraits of my models and have those portrait projected into frames. After researching what would be the most interesting camera for that project I came across a scanner. The benefit of using a scanner is it’s very short focus length, which creates by default a strong chiaroscuro effect therefore a very original imagery. The mechanism of the scanner also takes pictures per lines scanned, and reassembly it into one image. The more the subject moves during the scan the more distort the image will be. It allows the model to interact with the photographic process and create its own unique portrait." ​This piece was shown for the first time for the ALT-ESC launch party in November 2016. To learn more about Jonathan, click here. Sam lives in Brooklyn and draws stuff, and sometimes people laugh, and sometimes they throw things, and some multitaskers exemplifying the modern age will do both at the same time. Intrepid clickers among you will encounter a variety of material on this site (which he's made a New Year's resolution to update on a regular basis) including longer journalistic comics like those he's created for The NY Observer and Biography or short comics like the Photo Finish comic strip that ran from 2009-12 in Time Out New York or the Misconnected series which began as a weekly single-panel strip in the NYPress (2008) and in 2015 became a regular feature of MAD Magazine. Since 2013, Sam has been the official artist in residence for the Irondale Center, creating numerous posters, fliers and promotional artwork for their productions. ABOUT THE FESTIVAL... Co-Produced by Letter of Marque Theater Company (LOM) and Strike Anywhere Performance Ensemble (SA), this Festival marks the first OFFICIAL collaboration between these two groups! LOM and SA members have been working together for over a decade and couldn't be more thrilled to be partnering with the Gemini & Scorpio Loft to present this burgeoning celebration of live composition. The 3rd year running, this particular year's Festival has a theatrical focus, featuring experimental and cross-disciplinary groups exploring live-composed story, narrative, theme, and journey. ABOUT LIVE COMPOSITION... Many groups in the Festival use a gestural composing technique called Soundpainting, a sign language for performers created by Walter Thompson in the late 1970's in New York. While having taken off in Europe and around the world, it is still relatively new stateside. Soundpainting was initially only used for music, but thanks to the contributions of Strike Anywhere Performance Ensemble's, Leese Walker, it was developed for actors and, eventually, dancers. Now, joined by more and more new ensembles, Soundpainting is on the verge of hitting NYC as a powerfully vibrant tool for spontaneous performance and storytelling.